Love Sacred Hearts Academy? Love golf? Sign up for the 2nd Annual Lancer Benefit Golf Tournament sponsored by the Lancer Athletics Booster Club! A great opportunity to help raise monies for the athletics programs here at the Academy! Sign up today by filling out an ENTRY FORM or contacting Ellen Manzano, '85 at ellenmanzano@yahoo.com or calling (808) 393-5393 for more information. Can't make it but want to support? Read a special letter from the Athletic Booster Club President Jackie Burnett, ' 85, golf chairperson Ellen Manzano, '85 and Athletic Director Ryan Hogue. Or sign-up to volunteer! Need a bit more detail? 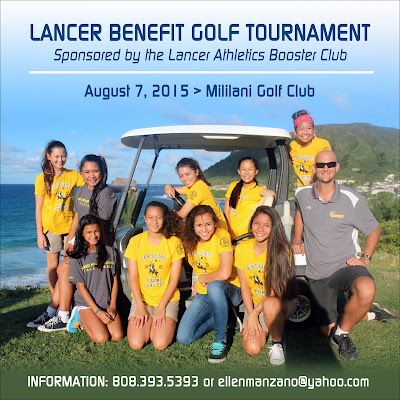 Check out the Lancers Athletics Booster Club2nd Annual Benefit Golf Tournament brochure!